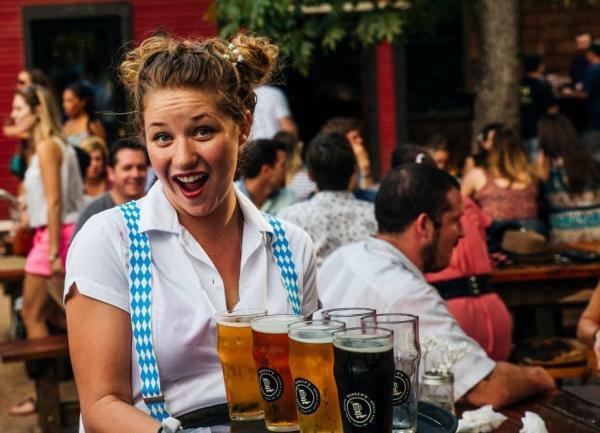 Whether you’re in town for Austin City Limits, a fall weekend getaway or just looking for some good bier and schnitzel, we’ve put together the definitive guide to all things German this October. Prost! Courtesy Banger&apos;s Sausage House & Beer Garden. Austin first co-op brewpub will be hosting a series of Oktoberfest-themed pint nights through October 5. Stop in for special tappings of Oktoberfest and other classic German-style beers. Insider tip: pair your bier with the Texas Cheese Board, featuring selections from local cheese mongers Antonelli’s! Head to the Texas Hill Country for one of the most authentic German heritage celebrations in Texas. What to expect: dancing, games, an OkTubaFest (yes, you read that right! ), kids’ entertainment, creative German plates and tons of imported beers (alongside local lagers). Head to the South Austin patio bar for an Oktoberfest party of Texas proportions. Come for the bier and brats and stay for the funky contests and south Austin culture. Celebrate an authentic-style Oktoberfest with the German-Texan Heritage Society who holds this annual festival, featuring live music, food, a biergarten, kid&apos;s activities and more at the historic German Free School. Grab your best stein and head to this local brewery for the launch of the Zilker Festbier. Sway to tunes from Charles & the Fabulous 4 while snacking on sausages from Best Wurst. Whether you prefer to brew beer, honey mead or kombucha, you can celebrate the art of fermentation at the Fermentation Festival. Attend workshops, specialty tastings, meet and greets and more. This year, the Austin Saengerrunde will celebrate the 4th annual AustOberfest in conjunction with the 150th anniversary of Scholz Garten, the oldest continuously operating tavern in the state. This festival celebrates German heritage in Texas with local german-style beers, sausage from some of the best BBQ-ers in town, bowling, live music and plenty of room to polka the night away! Celebrate the best of Austin craft brewing Special tappings and tastings at various breweries and bars, celebrating all things Austin. Make time for a day trip to beautiful New Braunfels and come hungry for this iconic Texas food fest. Brings the kids to the carnival, shop for holiday gifts are the Bavarian market, spend the afternoon exploring Germany in the Biergarten or dance the night away while enjoying one of the five live music stages.